Vahe Hovhannesian, a 31-year-old jeweller and Syrian refugee, sits by his work table in a studio in Yerevan. An empty coffee cup, full ashtray, pliers, monocular glass loupe and weighing scale are scattered in front of him, along with a small pile of gold chains. His fingertips are stained black and he is sizing an engagement ring. In the corner of his cramped studio, a small portrait of Jesus hangs on the wall. Outside, merchants barter and sell rings, bracelets, watches and other jewellery under the glare of fluorescent lights. It is a typical morning at World of Gold, a market in the Armenian capital. Hovhannesian is one of tens of thousands of Christian Armenians who have returned in the wake of Syria's civil war. Two years ago, he was living in Aleppo, dodging snipers on his way to work. "Every day leaving my apartment, I knew that I could not turn right," Hovhannesian said. "I should always go to the left, otherwise I might be killed. There was a small territory in our district I had to cross to go to my workplace. I knew that there was a sniper and I was running so that he could not target me. Every day I had to run." In early 2016, before Syrian President Bashar Al-Assad's offensive on Aleppo, a rocket exploded in front of Hovhannesian's house. "The rocket fell right on our building," he said. "It was useless to run or try to hide." The explosion nearly levelled their home. "At that moment I realised that I had to leave Syria." Hovhannesian hired a taxi that drove him, his ageing parents, and his cat, Vito, to the Lebanese border. From there, they hitchhiked to Beirut, where they boarded a flight to Yerevan. "We could take only our personal belongings and clothes. We left everything there, the apartment was fully furnished. We left the key to our neighbour." Ethnically Armenian, Hovhannesian is one of at least 22,000 Syrian-Armenian refugees who have travelled to the country since Syria's conflict erupted in 2011. The Hovhannesian family's journey, or return, has been in the making for over a century, beginning with the 1915 mass killings allegedly by Ottoman forces, which Armenians describe as genocide. Thousands were deported at the time. For Christian Armenians, Aleppo became a sanctuary. "Armenians have lived in Syria for centuries," said Adam Pomiecinski, a professor of ethnology and anthropology at Poland's Adam Mickiewicz University. "A large diaspora was created after the Armenian genocide. The memory of this trauma is an important part of [their] cultural heritage." Armen Minassian of the Idea Foundation, an NGO that provides humanitarian assistance to refugees in Yerevan, said: "We know first-hand what it is to be a refugee." Syria's acceptance of a Christian Armenian diaspora a century ago, Minassian said, is one of the driving factors behind contemporary Armenia's willingness to resettle tens of thousands of Syrian-Armenians. The Armenian government grants citizenship and employment rights to Syrian refugees who can prove their Armenian lineage. Hovhannesian's parents were naturalised after they presented documents showing they were members of the Armenian Apostolic Church. "It was only natural to welcome refugees to Armenia from Syria, [and] not only to those of Armenian descent," he explained. Hovhannesian lives with his brother Zareh and parents, Andranik Hovhannesian and Vergin Khachaturyan in an apartment. His parents were living in southeast Turkey when violence unfolded in 1915. They settled in Aleppo in 1946, where they found a home for 70 years. Hovhannesian's father supported the family by frequently travelling to Libya for work. Prior to the Syrian conflict, neither Vahe nor his parents had set foot in Armenia. Arriving as a refugee was "numbing", he said. 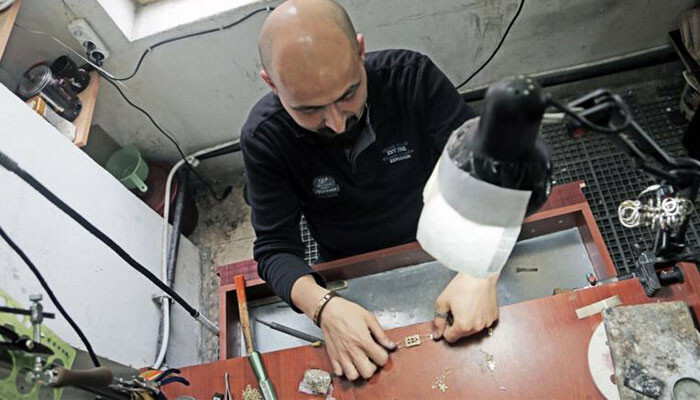 Hundreds, if not thousands, of ethnic Armenians who arrived from Syria, work as jewellers. One floor above Hovhannesian's studio, another Syrian Armenian, Vrezh Srapian, meticulously paints silver pomegranate pendants with acrylics. Each piece fetches about 700 Armenian dram ($1.50). "I have to pay for our apartment rent, studio rent, and earn our living," said Srapian, who left Syria in 2011. "Yesterday we left studio at 10:30pm. It was early, sometimes we leave at 1am." Pierre Akkelian, cofounder of the Armenian Jewelry Foundation, said the craft was "part of Armenian DNA". Akkelian, who also grew up in Aleppo, settled in Montreal, Quebec, Canada in 1970. "It goes back to the beginning of history. We've been jewellers and metallurgists since time eternal. Armenians are to jewellery, what the Swiss are for watches," he said.